• harm clients, colleagues, or third parties. Be alert to potential or actual conflicts of interest. Inform clients and colleagues about potential or actual conflicts of interest; explore reasonable remedies. Consult colleagues and supervisors, and relevant professional literature, regulations, policies, and ethical standards (codes of ethics) to identify pertinent boundary issues and constructive options. Design a plan of action that addresses the boundary issues and protects the parties involved to the greatest extent possible. Document all discussions, consultation, supervision, and other steps taken to address boundary issues. Develop a strategy to monitor implementation of action plan. First, mental health professionals should always be vigilant in their efforts to be alert to potential or actual conflicts of interest in their relationships with clients and colleagues. 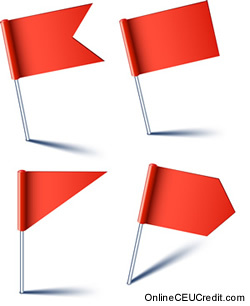 Mental health professionals should be cognizant of "red flags" that may signal a boundary problem. For example, clinical mental health professionals should be wary of situations in which they find themselves attracted to a particular client, going out of their way to extend the client's counseling sessions (facilitated by scheduling the favored client at the end of the day), treating the client as someone "special," disclosing confidential information about other clients, acting impulsively in relation to the client, allowing the client to accumulate a large unpaid bill, and disclosing very personal details to the client (Simon, 1999). Similarly, nonclinical mental health professionals (for example, administrators, researchers, community organizers) should be alert to comparable warning signs, such as granting extraordinary special favors to clients or colleagues and granting unprecedented exceptions to clients or colleagues who have not fulfilled contractual agreements. Second, mental health professionals should inform clients and appropriate colleagues when they encounter boundary issues, including actual or potential conflicts of interest, and explore reasonable remedies. Third, mental health professionals should consult colleagues and supervisors; relevant professional literature, regulations, and policies; and ethical standards (relevant codes of ethics) to identify pertinent boundary issues and constructive options. Special care should be taken in high-risk circumstances. For example, clinical mental health professionals who attempt to make decisions about a possible friendship with a former client should consider prevailing ethical standards that take into consideration such factors as the amount of time that has passed since the termination of the professional-client relationship; the extent to which the former client is mentally competent and emotionally stable; the issues addressed in the professional-client relationship; the length of the professional-client relationship; the circumstances surrounding the termination of the professional-client relationship; the amount of influence the mental health professional has in the client's life; available, reasonable alternatives; and the extent to which there is foreseeable harm to the former client or others as a result of the new relationship (Ebert, 1997; Reamer, 1998a). Fourth, mental health professionals should design a plan of action that addresses the boundary issues and protects clients, colleagues, and third parties to the greatest extent possible. In some circumstances, protecting a client's interests may require termination of the professional relationship with proper referral of the client. It is particularly useful for mental health professionals to imagine how a thoughtful panel of peers in the profession would perceive their course of action. Fifth, mental health professionals should document all discussions, consultations, supervision, and other steps taken to address boundary issues (for example, consultation with colleagues or supervisors about whether to accept a client's invitation to attend a life cycle event or terminate services to a client when conflict of interest issues arise). Finally, mental health professionals should develop a strategy to monitor the implementation of their action plan, for example, by periodically assessing with relevant parties (clients, colleagues, supervisors, and lawyers) whether the strategy minimized or eliminated the boundary problems. To promote practitioners' actual implementation of this protocol, mental health professionals can sponsor staff training and continuing education workshops. In addition to presenting conceptual content related to boundary issues and dual relationships, such workshops can role-play realistic case scenarios to enhance mental health professionals' ability to protect clients, colleagues, and third parties, and to reduce risk. There is no question that mental health professionals have developed a richer, more nuanced understanding of boundary issues in the profession. To further enhance this understanding, mental health professionals must examine dual relationships that are exploitive in nature and those that are more ambiguous. Practitioners' firm grasp of boundary issues involving their intimate relationships with clients and colleagues, responses to their own emotional and dependency needs, pursuits of personal benefits, altruistic gestures, and responses to unanticipated circumstances will increase their ability to protect clients, colleagues, and themselves. Most important, skillful management of boundary issues enhances mental health's ethical integrity, one of the key hallmarks of a profession. The preceding section contained information about managing dual relationships. Write three case study examples regarding how you might use the content of this section in your practice.